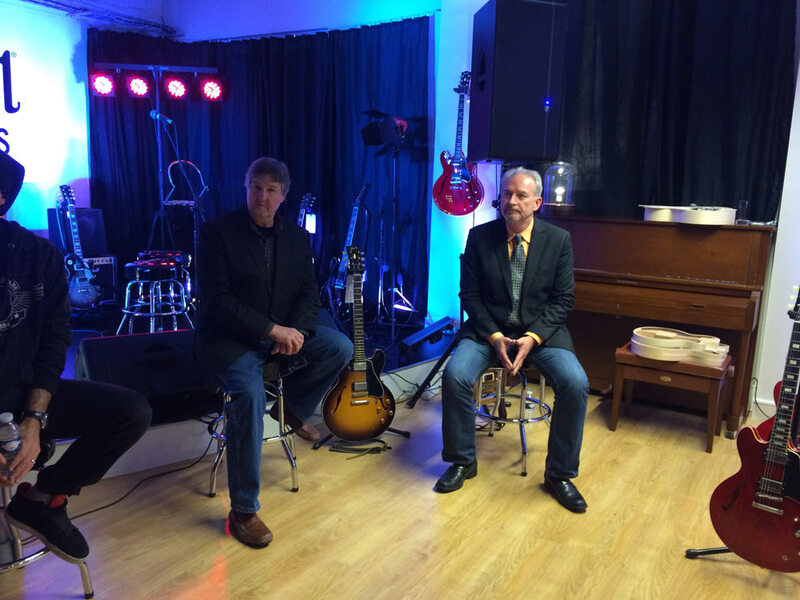 Mike Voltz and David Winters (Gibson) – Interview – La Musique est à tout le Monde ! Bienvenue sur le blog de Woodbrass. Gibson is as iconic a brand as they come. With a history of more than a century including many innovations and more than a few legendary models (the Les Paul, the SG, the ES-335, the J-45…), the current team builds them the good ol’ way while still trying to come up with better mousetraps. 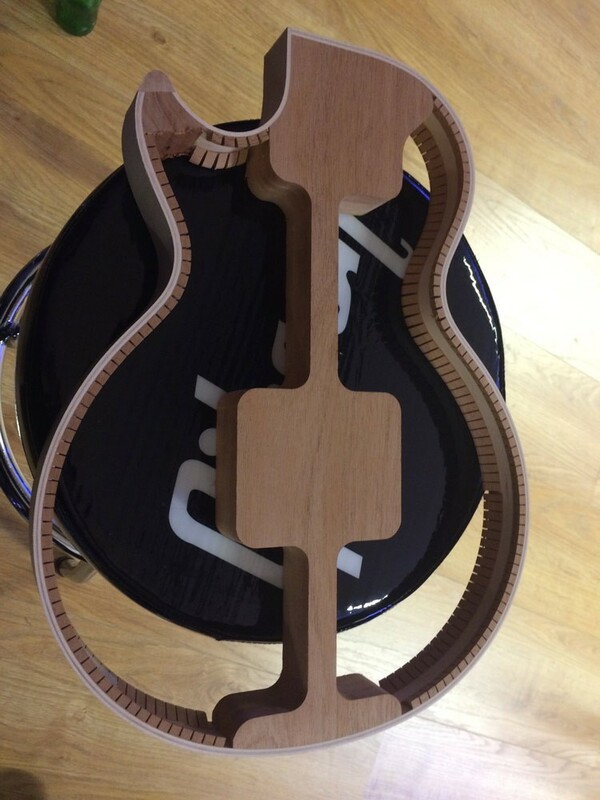 Gibson owns four factories: two in Nashville (the solidbody factory and the Custom Shop), one in Bozeman, Montana (for acoustics) and one in Memphis, dedicated to hollow-body guitars. Gibson single-handedly invented the semi-hollow with the ES-335 in 1958 and continues to build those perfect hybrid instruments to this day. We talked with David Winters (head of the Memphis factory) and Mike Voltz (head of R&D) on the occasion of a press event where we were introduced with the 2015 Memphis models. 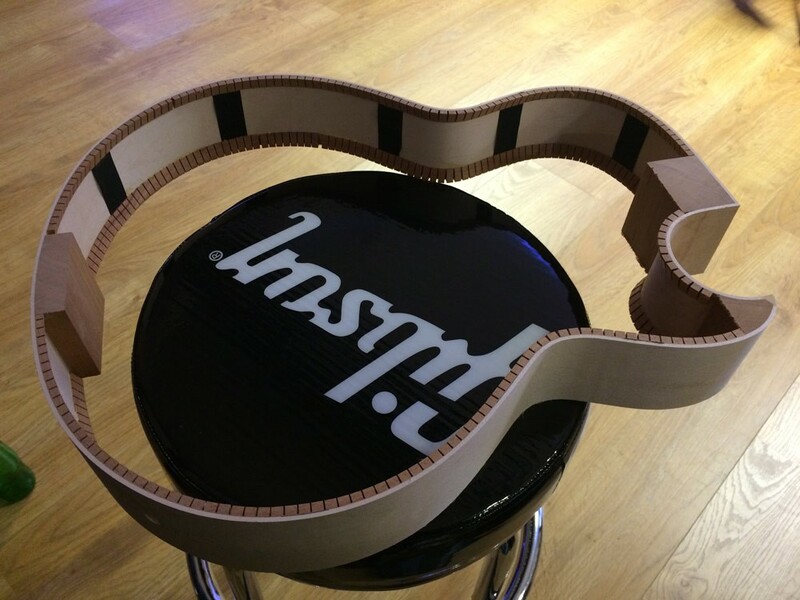 You’ve probably been asked that all day long but can you describe your job at Gibson? Mike Voltz: You’re the first that’s even asked what our job was! 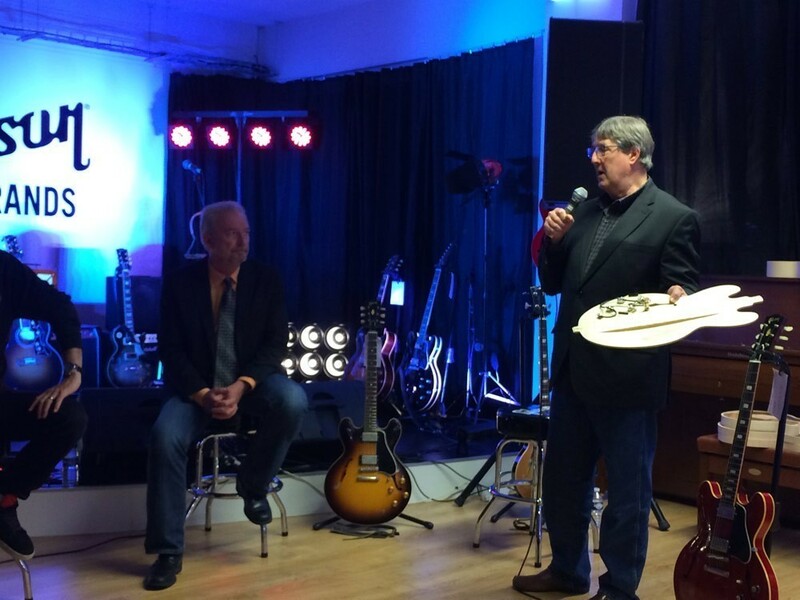 David Winters: I’m the general manager of Gibson Memphis, I’ve been at Gibson for over 25 years, Mike got me hired in 1986. I started out in production, making necks. I’ve done multiple things with the company over the years: I’ve done everything from purchasing to scheduling to parts procurement to sourcing Epiphones in Korea, I did International Sales for several years. Then I figured out that my love and passion was for the operational side. I’ve been running the Nashville factory for 10 years and it’s been incredible. We’ve done nothing but continue to grow, it’s been a lot of fun and a lot of headaches at the same time. Mike: I’m director of R&D and product development. All I know how to do is build guitars. I’ve been with Gibson for 30 years. Prior to Gibson, I was restoring guitars for Gruhn, and I’ve worked in the repair shop at Sho-Bud, where I got to work with the best dobro setup guy in the world. All the Opry guys used to come, that’s where I learned to do setups. At George Gruhn’s I worked on the best guitars, the top of the heap. In 1984 Gibson finally made the transition from Kalamazoo to Nashville and they were looking for guitar builders. That’s when I came on board. I love what I do. When doing R&D, how do you manage to walk that thin line between reissues and new products? David: I don’t anything’s too left field. We have to protect our history and our legacy so we have our instruments that preserve it, but we have to be innovative and we have to try new things. If you remember a flip phone, people thought “Man, this is it!”, but someone was already thinking about the iPhone. So you have to have that drive forward in order to grow the business and to attract new consumers. It’s not just guitar players we’re looking for: we wanna make new guitar players. So innovation may draw people in, you can’t be afraid to take chances, you can’t be afraid to fail. You reissued the ES-330 three years ago. Mike: We reissued it ‘cause I love the guitar! That’s all there is to it. I’m an acoustic guy at heart, I’ve always liked the 330. A lot of players thought of the 330 as a poor man’s 335, but it’s not! It’s a different guitar. Grant Green wouldn’t have made the same music on anything else. It was the first Historic model we developed in Memphis, but people in the management department were telling me “the originals are not worth much, so don’t go there!”. A ’58 or ’59 335 is worth a lot of money, you could drop 25 000 dollars on one, whereas you can get a nice 330 for 6 000. But the reissue took off like a rocket. We took it to Summer NAMM without telling anybody we were doing that. The General Manager saw it and handed it to the owner of Wildwood Guitars, who owns a huge collection of vintage guitars. All he had to say was “the guitar is in an incredible condition!”. That was it! That one line launched us into the Historic business. That night we set up a little stage, we pulled in an AC-30 and a Marshall half stack. We had 3 reissues. Word got out and little by little people were coming into the room. If you do it right, all of these songs and memories come zooming at you. And all night long people played Beatles song, ‘cause you hit that thing and you get the instant Casino sound. I love vintage guitars so we were really careful to get the binding right, the neck and all that. We were always trying to reconnect the magic of the old ones. Is the Memphis factory still growing? Mike: David has put together the smallest factory Gibson has. Over the years, he’s put together this group of people who are really dedicated, they’re wonderful to work with and they just wanna build better guitars! It’s not easy: you gotta find the right people and grow those people. We love what we do. How many people are there currently working at the Memphis factory? David: We have about 120 people working there, and we’re constantly on the lookout for good people! We’re in a constant growth process, and really good top-notch people are hard to find. We’re looking for the best and the brightest to add to the team. And it really is a team: neither one of us can do what we do without the other 120 people in the factory. It’s born out of passion, and at the same time it’s a business. What’s the average production per day? David: The production is about 65 guitars per day right now. 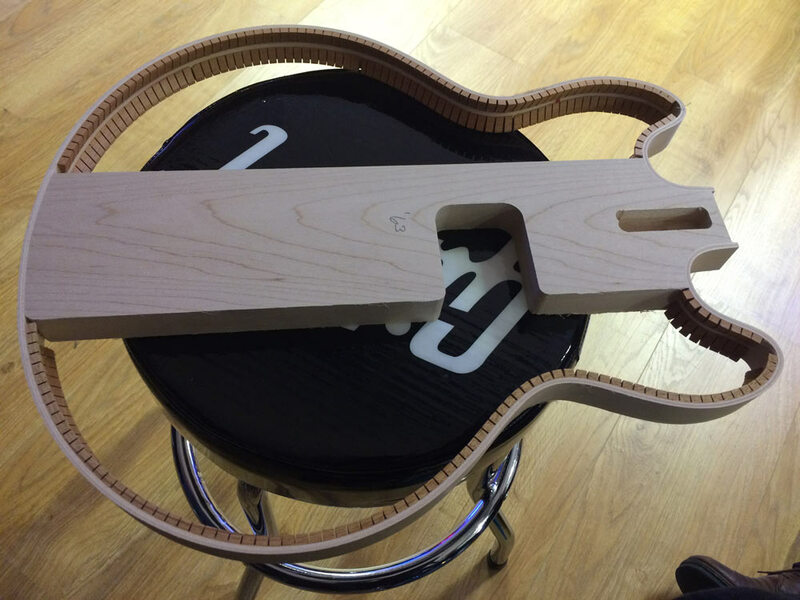 It’s really not that much, there’s still a lot of hand work that goes into our guitars. 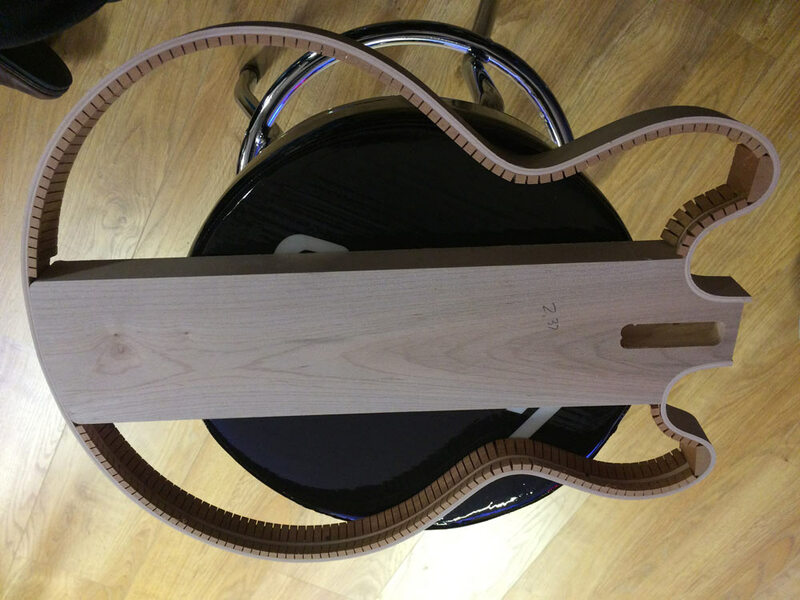 Hollow body guitars are not as simple to build as electrics, we’re closer to acoustics but it’s really its own animal. Mike: We hand-bend all of our cutaways, we use a hot pipe and a deep fryer. I suppose you’re both musicians? David: I’m not, I’m a really poor musician. I wouldn’t classify myself as a musician. Do you have any favorite models in your catalogue? David: For me it’s probably the ’59 ES-335. Mike: For me, ES-330. I love the vintage sunburst. And I couldn’t chose whether I want a Bigsby or not. That or a ’52 ES-295 like Scotty Moore.